TotallyTot | Creating Innovative Solutions for Everyday Women: Are you ready to DECLARE??? 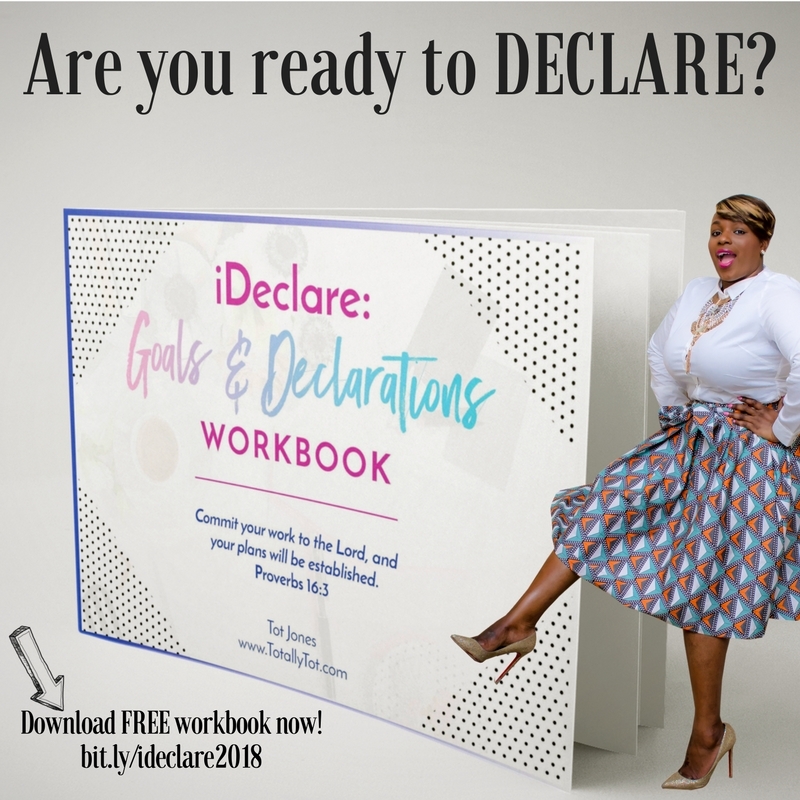 Are you ready to DECLARE??? Okay, so it is happening..........my dreams and goals are scaring the living crap out of me. Parts of me feel overwhelmed and unavailable for this level up that God is tugging on me to do. I have struggled to put my vision board together, but refuse to give up. Have you ever felt like you wanted to run from everything that God was calling you to do?? 2018 has met me with some requirements that are scary, to say the least. I have found myself with a brain full of thoughts and a heart full of fear. Fear of messing up. Fear of not being organized. Now, that I have been honest with my feelings, let's be transparent about the facts. God is GOOD!!! I know we hear this statement all of the time, but no, seriously, GOD IS GOOD!!!! I took these feelings to Jesus and HE gave me tools and strategies to implement and help me move past my fear. I have prayed over these things and I am now ready to share with you. This message is for the dreamers!! The people that are so pregnant with purpose, but afraid of that delivery room. What does it all look like? How does it feel? What should my next move be?? Well here are some tips that are helping me along the way! 1. PLEASE be honest with yourself regarding your feelings. Feelings are not facts! Acknowledging your feelings gives you the opportunity to deal with them in an appropriate manner. Once I feel a certain way, I can look up and meditate on scriptures to counter those feelings. For example, Psalm 56:3-4 says, When I am afraid, I put my trust in you. In God, whose word I praise, in God I trust; I shall not be afraid. What can flesh do to me? 2. Do a master brain dump! Get it all out of your head! Dream and imagine it ALL! Ask God to open your imagination up to the impossible that HE is capable of doing! Then write it all down! 3. Find a way to organize your thoughts! This is MAJOR KEY!!!! 4. For my final tip, I have a brand new resource just for YOU!!!! My first workbook is ready for download NOW!!!! This workbook will help you with tips 2 and 3! CLICK HERE FOR FREE WORKBOOK! CLICK HERE TO LEARN MORE ABOUT WORKBOOK!